The city of Poway, California is located in the county of San Diego and spans 39.165 square miles, .086 of which is water covered. Residents of the city identify themselves as Powegians and the city motto is "The City in the Country." The city has a council/manager form of government and is known for its many parks and trails. Poway is and has been home to many notable residents, including professional stuntman Jeremy Fry, writer James Singer and Emmy winning director Mark Risley. Many bands and musicians have called the city home like the punk band Unwritten Law, several members of the bands Allstar Weekend and Blink-182. The earliest known residents of the area that would one day be Poway where people of the Diegueño. Artifacts and pictographs from these early inhabitants can be foud along the banks of Poway Creek. The name Poway is derived from the Diegueño name for the valley area, Pawiiy. The land was governed by Spain for a time and then Mexico and finally the United States. American settlers began arriving for agricultural purposes the mid-1800s. By 1871 the settlement had established a school district but did not have an actual schoolhouse until 1885. Today education is provided by the Poway Unified School District which is made up of 30 schools spanning from elementary schools through high schools. According to the United States Census of 2010, Poway was home to 47,811 residents spread across 16,128 households giving the city a population density of 1,220.7 people per square mile. In 2000, the median household income was $92,083 and the median family income was $103,972. According to the City's 2013 Comprehensive Annual Financial Report the top five employers in the city were General Atomics Aeronautical Systems, Geico Direct, the Poway Unified School District and Cohu. Poway has mostly recovered and rebuilt since the Cedar Fire in October of 2003. The fire caused the evacuation of the citizens and caused wide-spread damage destroying a total of 54 homes. 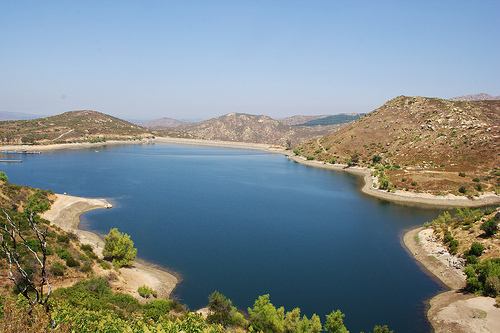 Poway is home to several parks including Aubrey Park, Starridge Park, Old Poway Park, Poway Community Park as well as Lake Poway and the Blue Sky Ecological Preserve. The city also has several trails perfect for hiking, biking and walking such as the City of Poway: Trails, Sycamore Canyon Preserve and Goodan Ranch and the Kumeyaay-Ipai Interpretive Center at Pauwai. All of these park lands and trails encourage residents to take part in healthy outdoor activities. Homes for sale in Poway range from small starter homes up through large luxury homes. Rental options include apartments, houses and multi-family structures such as duplexes. Other housing options like town houses and condominiums are available for sale or lease with a variety of amenities aimed at the comfort and security of residents. Call local real estate agents today to start exploring the bustling city of Poway and find the home of your dreams.